Last week another cryptocurrency inspired HYIP has joined DavidNews.com. No, they are not offering to invest in a new cryptocurrency, but trade with a good old Bitcoin. BitXxa joined DavidNews.com Golden Stage 5 days ago and has been Online in total for 14 days. Now I’m keeping in the project $400 and will keep you informed about the performance and frequency of payments. Let’s take a closer look and find out more about BitXxa. Do you want to hear more about BitXxa? I called it cryptocurrency expired due to its name and legend. Most of the time HYIP’s, which have “bit” in their names either accept bitcoin deposits or position themselves as cryptocurrency traders. In this case, BitXxa positions itself as a company, which is offering its clients to trade Bitcoins. 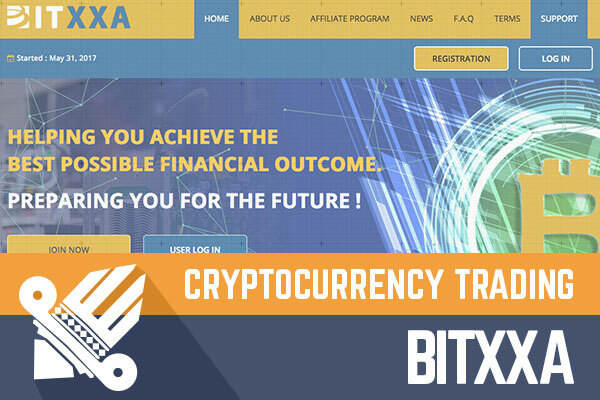 They are telling that BitXxa itself is a place where users are doing trading with cryptocurrencies. You might have read different HYIP legends. In the meanwhile, Bitcoins and cryptocurrency related HYIP’s are pretty common lately. BitXxa admin has done the homework by registering the company in the UK. Company registration details on the HYIP website and the Companies House website match. In fact, you can check the address on the Google Street View and see where the company is registered. The company has been incorporated on the 21st of February 2017 and has specified Financial Management as a nature of the business. As I have mentioned it several times, company registration information is not a proof for a HYIP or a signal, which will impact its performance, but it’s lately a common thing. More like a homework, which is an extra mile. Those who read my previous review might think I’m a big fan of interactive elements on the website. In fact, I’m not. However, I just realized that BitXxa same as Infinitia (the HYIP from the previous review) had implemented similar interactive element on their home pages. It has a different design and visual appearance, but in both cases, you see moving dots, which are connected with lines. What a coincidence, right? Even if these both HYIP’s had the same admin, it would be hard to find it out. Moreover, probably it’s just a coincidence. I must say BitXxa has a website with very few functions and simple web design. It is built with the Golde Coders script. For those of who are not familiar with it, Gold Coders offer scripts for HYIPs. Unfortunately, the website doesn’t have a mobile responsive design. It’s just being scaled on the smartphones. However, all major information for a potential investor can be found on the website. For me, it was hard to notice that “What we offer?” content block on the home page is a calculator. I clicked on it by coincidence. Most likely, some users will miss it and will not find out how beneficial or unrewarding the plan with another deposit amount than $100, which is set by default in the calculator. Enough of the web design, HYIP stories and my subjective opinion about it, right? Let’s move forward and examine the investment plan. Yes, it’s right – BitXxa offers only one investment plan (2.88% daily), which is much easier for beginners to understand what is what. The only thing, which is not mentioned on the calculator is the fact that deposit is locked in forever. Therefore, I highly recommend calculating the break-even point for the potential investment, to understand when the deposit will make a profit. Just to give you an example, investment of one of my favorite amount of $200 would reach the break-even point in 35 day’s time. Day 36 is the first day when the daily profit of $ 7,36 is being made ($1,6 on the 35th + 5,76 on the 36th). Conclusion? Suit yourself and figure out it’s worth risking, to find out if it will allow investors to gain a profit. To sum up, a brief overview of everything mentioned in the review above. First, it’s another Bitcoin inspired HYIP offering to make an investment in cryptocurrencies. Second, BitXxa admin has registered the company for this HYIP in London. Third, it has a standard website with all major information there for a potential investor, but there is space for improvements, which would improve the user experience for both desktop and mobile users. Finally, BitXxa is offering one simple investment plan with 2.88% daily rate, which reaches its break-even point after 35 days. So far, nothing suspicious about it. However, in most cases storm comes when it is not expected. As always keep in mind that all HYIP’s are highly risky and you are the only person responsible for your investments. Therefore, if you ever decide to make any investments, don’t invest more than you can afford to lose! Investment plans: 0.12% hourly (2.88% daily) for an unlimited term, initial deposit locked in forever. YoBit allows you to claim FREE COINS from over 100 distinct crypto-currencies, you complete a captcha one time and claim as many as coins you want from the available offers. Did you know that you can get them ON AUTO-PILOT & TOTALLY FREE by registering on You Like Hits? BitKong Test your courage and get bitcoins from the big bad kong. DON'T Forget: Claim free bitcoins every 10 minutes from the faucet. If you are trying to buy bitcoins online, Paxful is the ultimate source for bitcoins as it allows buying bitcoins by 100's of different payment methods, such as MoneyGram, Western Union, PayPal, Credit Cards and even exchanging your gift cards for bitcoins. Did you consider picking the ultimate Bitcoin exchange service - YoBit.